Home › AIR GUNS AMMUNITION › PELLETS H & N › Air gun pellets H & N Field Target Trophy 5.5 mm. Air gun pellets H & N Field Target Trophy 5.5 mm. Pellets for air gun H & N Field Target Trophy 5.5 mm. Caliber 5,5 mm. Weight 0.95 g. Quantity 500 pieces in box. 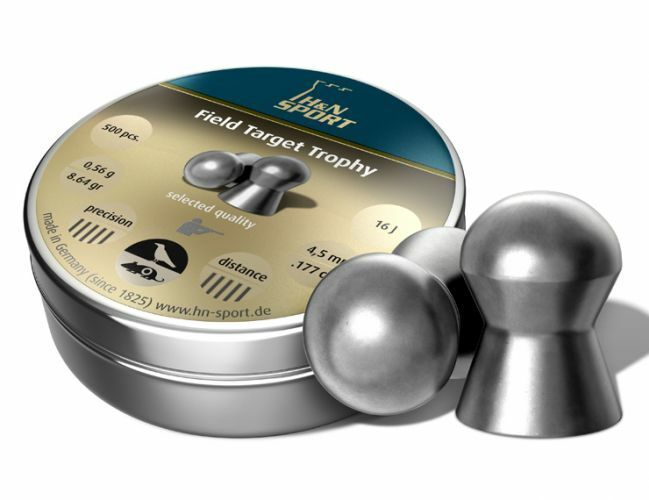 Medium-weight, extremely accurate competition pellet with flat trajectory for medium ranges. Exceptional aerodynamic design for high impact and penetration. Tightest shot groups. Lowest rate of lead fouling and consistent shot spreads thanks to special alloy and lubrication. Smooth.